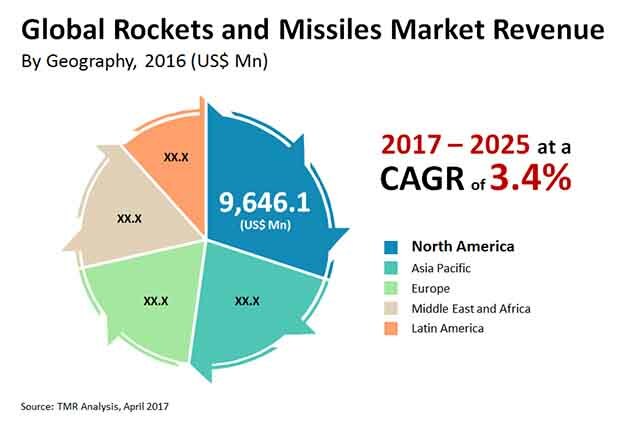 The global market for rockets and missiles is anticipated to witness a substantial surge over the next few years, thanks to the increasing expenditure by various governments on their respective defense and military sectors. The rise in the defense budget will help in the uptake of technologically advanced rockets and missiles required for the strengthening of the defense forces across the world. Several nations, such as the U.S., the U.K., China, India, Russia, and Israel are likely to invest a massive amounts of money in designing and manufacturing modern rockets and missiles to equip their military forces and export them to other countries in the near future, which is also projected to support this market over the forthcoming years. However, the risk of malfunction of rockets and missiles launchers may hinder the market’s growth in the near future. The global market for rockets and missiles was worth US$32.10 bn in 2016. Rising at a CAGR of 3.40% from 2017 to 2025, the opportunity in this market is anticipated to reach US$ 43.01 bn by the end of 2025. Based on the geography, the global market for rockets and missiles is classified into the Middle East and Africa, Europe, Asia Pacific, North America, and Latin America. In 2016, North America dominated the market with a share of 30.1%. The extensive researches for the development of technologically advanced rockets and missiles, being carried out in this region to strengthen its defense forces, has been propelling the North America market for rockets and missiles. Researchers expect this scenario to remain so over the forthcoming years, with the U.S. emerging as the leading domestic market for rockets and missiles in this region. On the flip side, Asia Pacific is anticipated to surface as a promising market for rockets and missiles in the years to come. Several countries, such as China and India are investing a massive sum in designing, developing and manufacturing modern rockets and missiles in order to equip their forces with the same. South Korea, on the other hand, is in the process of procuring large numbers of rockets and missiles. These factors, as a result, is projected to boost the Asia Pacific market for rockets and missiles over the next few years. Artillery and air to ground rockets are the two prime types of rockets available in the global market. The demand for artillery rockets is a bit higher than air to ground rockets and the trend is anticipated to continue over the coming years. In terms of missiles, the market is categorized into surface to air missiles, cruise missiles, anti-ship missiles, anti-tank missiles, anti-submarine missiles, and others, such as air to air missiles, air to ground missiles, intercontinental ballistic missiles, and anti-radiation missiles. Surface to air missiles have been reporting a higher demand than other missiles available in this market. Analysts project this trend to remain so in the years to come, thanks to the efficiency of surface to air missiles in destroying the enemy aircraft, helicopters, and various incoming rockets and missiles. Lockheed Martin Corp., BAE Systems, Northrop Grumman Corp., Raytheon Co., General Dynamics Corp., Boeing, Thales Group, Leonardo, Rafael Advanced Defense Systems Ltd., and MBDA Missiles Systems are some of the key vendors of rockets and missiles across the world. The rockets and missiles are used to destroy the enemy aircrafts, helicopters, incoming missiles or rockets, tanks, ships, submarine, armored vehicles, and artilleries among others. Rockets are unguided, self-propelled munitions, powered by jet engines or rocket motors while the missiles are guided, self-propelled weapons which are used for surface to air combat, air to surface combat, air to air combat. The growing year on year defense budget in the developing countries is a major trend for the rockets and missiles market to surge. The defense forces across the globe are constantly equipping their respective troops with the latest and enhanced rockets and missiles in order to strengthen their armed forces, air force and naval force. Thus, the demand for strengthening of defense forces across the globe is driving the market for rockets and missiles. Moreover, the demand for technologically advanced munitions is increasing in the defense sector across the globe. Rockets and missiles plays an important role during combat as they can be short range or mid-range or long range rockets and missiles. Owing to this fact, the defense forces in developed countries as well as developing countries are demanding for technologically advanced rockets and missiles in order to safeguard the country during combat. The growing demand for technologically robust rockets and missiles are boosting the rockets and missiles market. The rockets and missiles market is driven by various factor, however, the market faces a major challenge i.e. high cost of the advanced technologies. The rockets and missiles manufacturers are constantly focusing on upgrading the rockets and missiles by incorporating different latest technologies. These latest technologies are much expensive as compared to the older technologies, and due to this, the cost of the final product is increasing which is limiting the developing countries to adopt these advanced rockets and missiles. This market has potential opportunities to grow in future as the manufacturing companies are designing and developing smokeless missiles. The smokeless missiles can be fired from an aircraft or a naval ship or from land without giving any clue of firing region to the enemy. The smokeless missiles can travel long distances ranging from 300 meters to 1000 meters which is much longer than the existing missiles. These benefits of smokeless missiles are poised to fuel the market for rockets and missiles in the coming years. The rockets and missiles market is segmented on basis of product types and geography. Rockets and missiles are the two types of products considered in the study. The missiles segment captured the largest market in 2016 and is estimated to be the fastest growing segment during the forecast period from 2017 to 2025. Based on rockets, the market is bifurcated into artillery rockets and air to ground rockets. In the rockets segment, artillery rockets held the maximum market share in 2016 while, the air to ground rockets are anticipated to grow at a faster rate than the artillery rockets over the period from 2017 to 2025. Surface to air missiles, cruise missiles, anti-ship missiles, anti-tank missiles, anti-submarine missiles and others are the types of missiles. The others sub segment includes air to air missiles, air to ground missiles, intercontinental ballistic missiles, and anti-radiation missile. In 2016, surface to air missiles held the largest market share and it is estimated to grow at a significant rate as compared to other missiles in the missiles segment. Geographically, the market for rockets and missiles is categorized as North America, Europe, Asia Pacific, Middle East and Africa and Latin America. The dominant region in the market for rockets and missiles in 2016 was North America, while Asia Pacific is expected to be the fastest growing region globally. The major vendors of rockets and missiles across the world are Lockheed Martin Corporation (U.S.), BAE Systems (U.K), Northrop Grumman Corporation (U.S.), Raytheon Company (U.S.), General Dynamics Corporation (U.S.), Boeing (U.S.), Thales Group (France), Leonardo (Italy), Rafael Advanced Defense Systems (Israel), and MBDA Missiles Systems (Germany).